juggling sheet music while trying to keep playing, and you live in constant fear of clumsy stand partners, pets, or family members sending it tumbling to the floor. To add insult to injury, nothing ruins the effect of a well decorated practice space or home than the utilitarian look of a wire music stand. Certainly not the best looking or safest place to keep your music. Thankfully, there are a variety of options available for higher quality, safer, and more attractive stands. 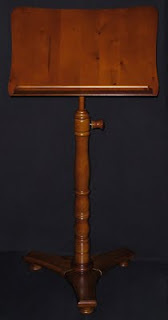 A wood music stand offers increased functionality, sturdier construction, and more space to hold your music. Wood stands are also much easier on the eyes. Today we want to feature a few of the stands available through our violin shop - affordable alternatives to cheap music stands. The Oxford Find Wood Music Stand is available in lovely Walnut, Mahogany, or Ebony finishes (Walnut pictured here). The solid music desk can hold up the heaviest of music books and the sturdy tripod base means that you don't have to worry about the dog or your stand partner knocking it over (unlike those wire music stands!). The Oxford is available in two sizes - one that can accommodate a range of seated and standing postures, and one designed specifically for seated musicians such as cellists or guitarists. The best part is that the Oxford can hold its own with the classiest of rooms, and do it at a very affordable price. Pictured here in a Mahogany finish, but also available in Walnut, the Cremona Fine Wood Music Stand is just as sturdy and well-built as the Oxford, but features an expertly carved decorative music rack. If you need a beautiful place to keep your book of Bach Cello Suites, look no further than the Cremona. The Performer Fine Wood Music Stand is one of our highest quality stands, pictured here in a Walnut finish. Like the Oxford, the Performer is available in both "normal" and "seated" sizes, and is distinguished by a fancier, interlocking base and ornate center pole. The Performer, like the other stands featured here, is a piece of furniture in addition to being a music stand. Quality wood components and lovely finish colors make it stand out in any context. This is not a stand to hide in the closet when you have visitors. These stands and many more are available at our shop in St. Paul, MN, as well as through our website at www.FineMusicStands.com. Don't continue to let your cheap music stand elevate your blood pressure and endanger your instruments and music. A quality wood music stand can brighten a room, make practice easier, and end the aggravation of those cheap, wire and metal music stands.